Last night Janis and I ran into Beverly Giammalva at a function. She is the widow of a very dear old friend, Joey Giammalva. Joey and I grew up together in Kenner, and we go back as far as I can remember, like when I was around six. I lived on Sixth Street near the corner with Williams Street. Joey lived on the same block as me but facing Minor Street, and just so happens right across the street from my future bride, Janis Cristina. Joey, Manard Lagasse, and I were the closest of friends in those days and remained so through high school, even though I went to East Jefferson, and Joey went to De La Salle. We kind of drifted apart after that, simply because we were separated by schools. Both Manard and Joey were two years younger than I was. Joey and I reconnected a bit, when I transferred to the University of Southwest Louisiana, and he was attending there. As I was talking to Beverly, my emotions were flooded with memories of Joey and me as kids. What came to mind? For one, his home on Minor (in which Beverly still resides). I can still picture every room. I would show up there on Saturday morning and find Joey watching TV in their den, a smallish room at the back of the house. He had a back porch that was initially only screened, and then Mr. Giammalva added jalousie window glass. We were not allowed in the living room. The sofa was even covered with plastic. No, I’m not making that up. I think they used that room only once a year, Christmas. And, of course the kitchen. Mrs. Giammalva (Miss Mary) was a fantastic Italian cook and somewhat tradition bound, because they had the same meal every Sunday at noon: spaghetti and meatballs and fried chicken. I’m not sure, but I don’t think fried chicken is very Italian? Whatever, it was great fried chicken! I must confess that I sometimes managed to be around the Giammalva house about lunch time on Sunday a bit more often that perhaps I should have been, and naturally, they invited me to eat with them. Mr. Giammalva was an ice peddler for my future wife’s family business, Cristina Ice in Kenner. He delivered ice (some of us still had “ice boxes” then) to homes and businesses in his red, stake-bed, Studebaker truck. I will never forget that truck. And get this! His helper was none other than Lloyd Price, before he became a famous recording artist. Some of his hits: Lawdy Miss Clawdy, Staggerlee, Personality, and I’m Gonna Get Married. A resident of Kenner who made good. Mr. Giammalva also was a part-time trapper. He ran a trap line somewhere west of Kenner and brought in muskrat and little animals I think were mink. He treated the skins and hung them to dry in his two-car garage. I spoke elsewhere of Joey and me having Red Ryder BB guns. Did you know robins were good table fare? I didn’t either, but the enterprising Mr. Giammalva did. Robins migrate and in the fall stopped on the way south in his hackberry tree to feast on the little hackberries, often filling that tree with robins by the hundreds. Mr. G and Joey’s Red Ryder BB gun were waiting for them. Many robins went into his freezer after getting their fill of hackberries. And no, that wasn’t legal. But, hey, it was Kenner in the 1950s. Joey was a bit chunky when we were young but slimmed down as an adult. He suffered from flat feet, and I mean flat as pancake. We often played with the hose on the summer and Joey’s feet would make flatulence sounds on the wet concrete. Funny what you remember. And that one brought on the tears. We also had go-carts, and we were often chased by the Kenner Police for running them on the streets of Kenner. I wrote about some of those adventures here and here. 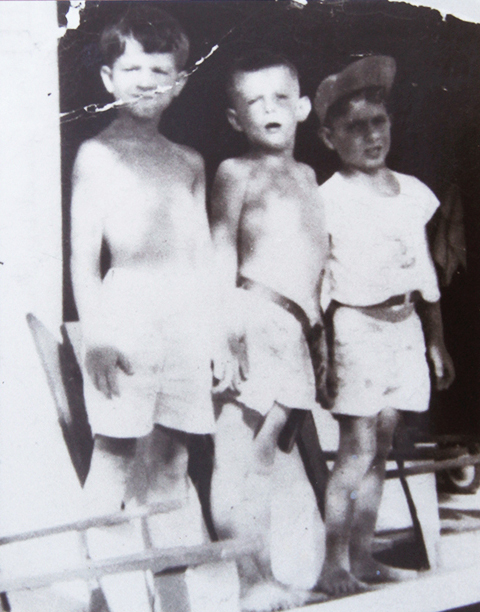 The photo above of (from left to right) me, Manard Lagasse, and Joey was taken by Mrs. Giammalva in Joey’s back yard. He carried that old photo around in his wallet for decades. Finally about twenty years ago, he made 8×10 copies for Manard and me and presented them to us. It hangs in my home office. I am sorry to say that both Manard and Joey are gone now. I miss them both, and unfortunately, we often don’t realize how much we miss someone until they are gone. If you have friends you love, spend time with them, because they won’t be here forever, and neither will you. Joey was a great guy. For some reason, I remember his driveway. I guess because it was next door to the vacant lot I put our pole vault pit on. It was one of those driveways with two ribbons of concrete and grass down the middle. It was on that driveway one Holloween night in 1958 that I was sitting listening to a transistor radio when Billy Cannon made his famous run against Ole Miss. I can remember it like it was yesterday. His uncle Jake was the policeman who used to turn his hearing aide down when he would drive by us shooting illegal firecrackers so he wouldn’t hear them and have to report us. I remember I, Martia and Robin would pick the neighbors flowers and then sell them to the neighbors. Miss Mary always had a quarter to buy back her own flowers! I really enjoyed your historical book…I read it straight through…my favorite time period…I to am a southern…Tarheel…please hurry on the third book. Thank you, Sharon. Book 3 is in the works. Details here.